Açıklama : This eerie landscape of incandescent plasma suspended in looping and twisted magnetic fields stretched toward the Sun's eastern horizon on September 16. 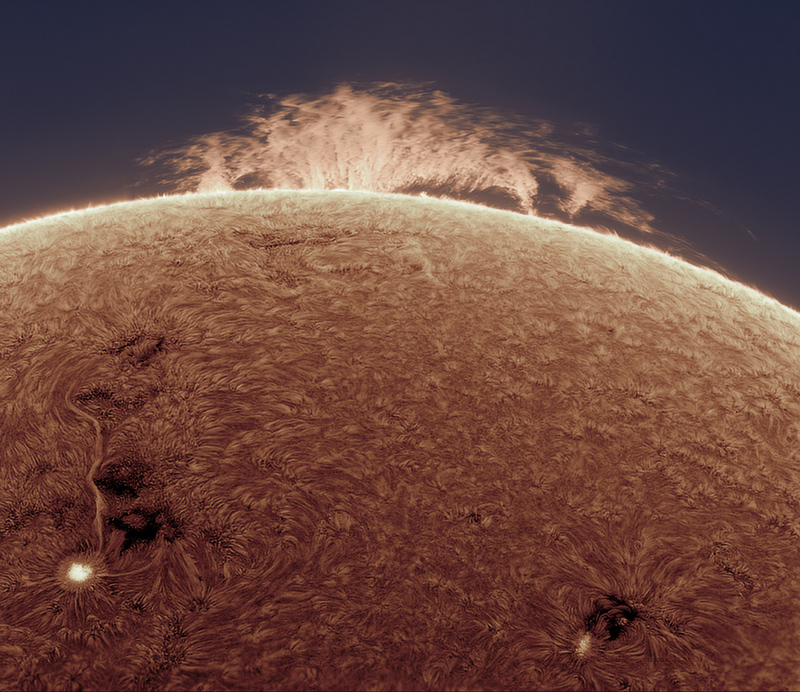 Captured through a backyard telescope and narrowband filter in light from ionized hydrogen, the scene finds bright plages near dark sunspots and a gigantic prominence lofted above the solar limb. Some 600,000 kilometers across, the magnetized plasma wall would dwarf worlds of the Solar System. Ruling gas giant Jupiter can only boast a diameter of 143,000 kilometers or so, while planet Earth's diameter is less than 13,000 kilometers. Known as a hedgerow prominence for its appearance, the enormous structure is far from stable though, and such large solar prominences often erupt.